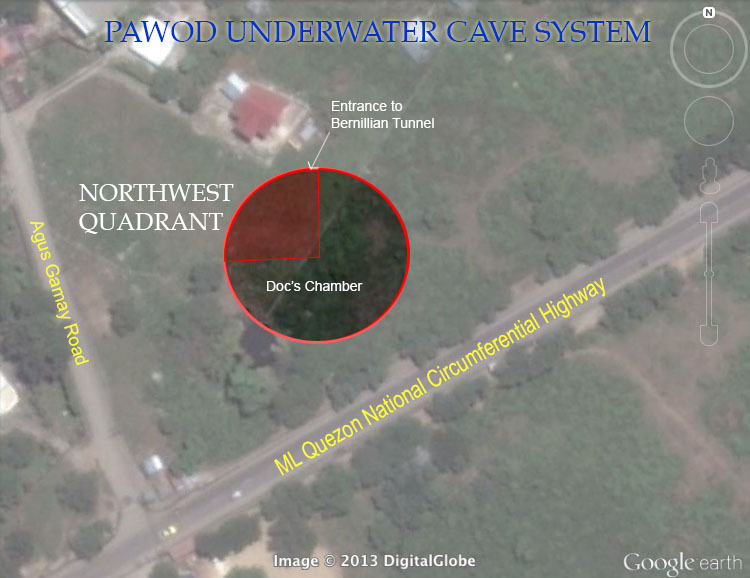 The staged comprehensive documentation project of Pawod Underwater Cave System (PUWCS) is underway. Phase I was done on May 31, 2013. Cave divers: FCD’s Bernil and Doc Amores. Photographer: Doc Amores. Photography was done using Nikon DSLR in housing, Tokina 10-17mm fisheye lens, Nikonos SB 105 strobe. Phase I covers the northwest quadrant of Doc’s Chamber. Phase II will be the northeast quadrant of Doc’s Chamber, Phase III the south half; and Phase IV, the Bernillian Tunnel and The Well. 2. Silt. Owing to the low position of Pawod as compared to the rest of the area, dust and other debris are drained to the cave during heavy downpours. The existing silt represents the accumulation over eons. 3. Entrance to Bernillian Tunnel. The tunnel is the only feature that branches out of Doc’s Chamber. It is approximately 152 meters long. 4. The northwest quadrant is characteristically lined by dark materials. It could be tannic in nature, but on further glance, it appears scorched. 1. The guideline. This is the most essential tool in cave diving. Figure shows arrows that point to the cave exit. 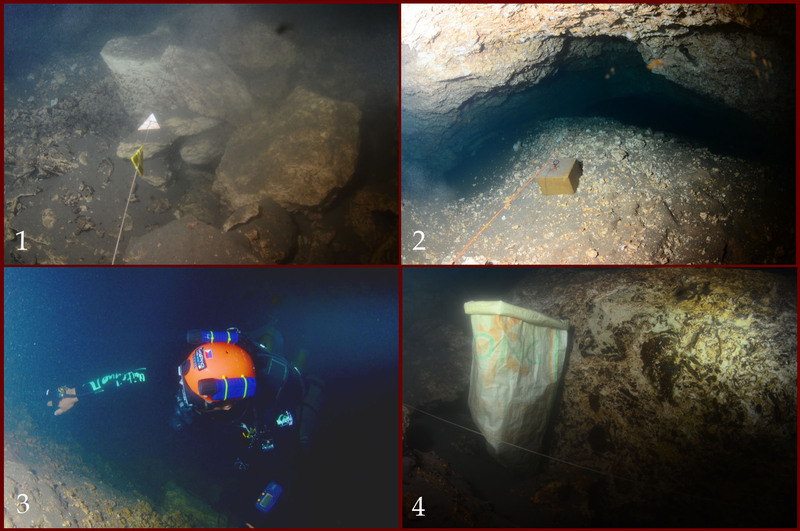 Loss of line following is one of the most serious mishaps in cave diving. Futile disorientation situations can result in out-of-air supply situation. The arrows are typically marked with the installer’s initials or identification and the approximate distance to the cave mouth. 2. Concrete blocks. Unscrupulous divers installed many of these concrete blocks without permission. The process of installing them probably contributed to significant erosion changes where fresh limestone dislodgement of various sizes are noted on the floor. At the very least, the presence of the blocks has destroyed the natural ambience of the cave. 3. Divers. The linings of Pawod are very porous limestone that easily get dislodged even with minor forces. Divers should be properly credentialed and briefed prior to entry into PUWCS. 4. Garbage. 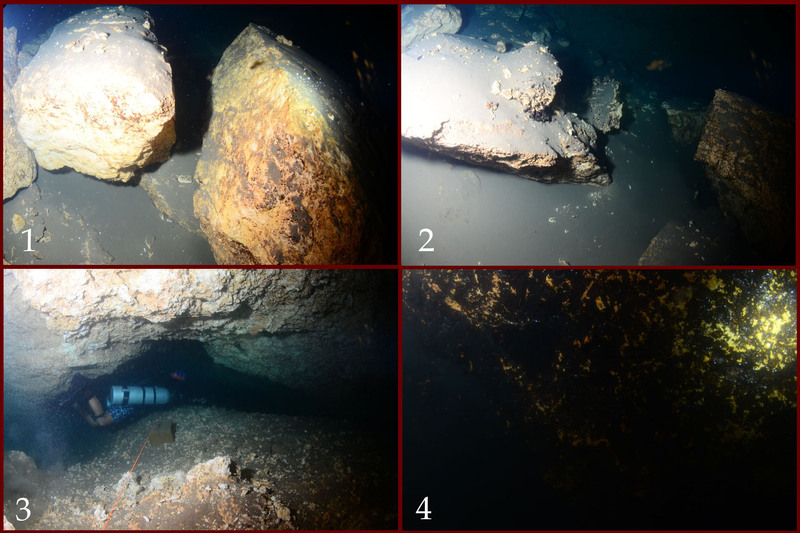 Figure shows garbage as far as 5 meters inside the cave. The Pawod pool is strewn with garbage of all imaginable kinds and origins. The area needs serious clean-up.